1 of 4 Heat 1 tablespoon oil in large nonstick skillet. Add onions; saute until golden brown, 10 minutes, adding 2 tablespoons water each time skillet seems dry. Scrape into large bowl. 2 of 4 Add beef, turkey, soy and sesame oil to onions. Shape into 6 patties, 4 inches in diameter. Spread nuts on waxed paper; press one side of each patty into peanuts. 3 of 4 In same skillet, heat 1 tablespoon oil. Working in batches if necessary, add burgers, peanut sides down, to skillet. Cook 5 minutes; turn over. 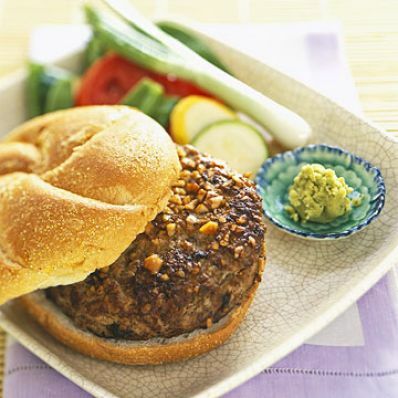 Cook 5 to 7 minutes, until instant-read thermometer inserted in centers registers 165 degrees F.
4 of 4 Serve burgers on toasted rolls with tomato, cucumber and pickles. Per Serving: 33 g pro., 38 g carb., 29 g Fat, total, 79 mg chol., 7 g sat. fat, 4 g fiber, 689 mg sodium, 545 kcal cal.